Royal Knights batsman Ryan Mangal, makes a defensive play in front of Wicket Keeper Jimmy Peters, that turned into a single when the Road Town Wholesale player misplayed the ball. 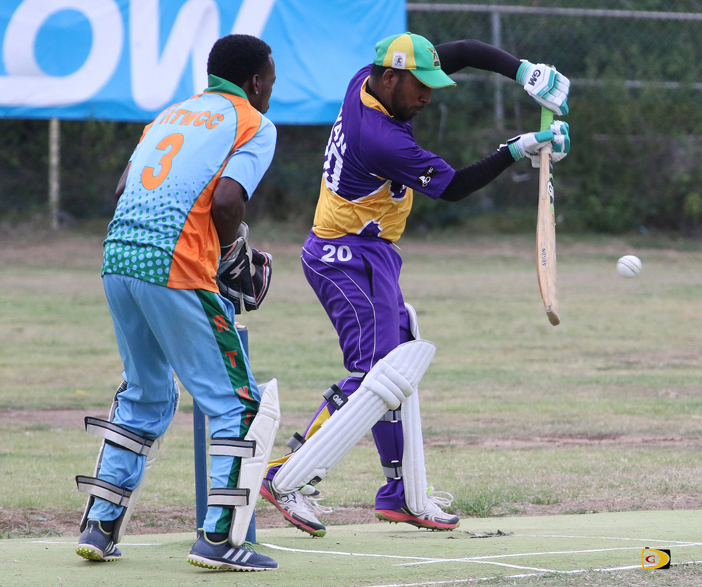 Finally, the paring is set for the BVI Cricket Association’s ultimate Twenty 20 prize on Sunday afternoon, when Royal Knights, who whipped Road Town Wholesale by six wickets during the semifinal in Greenland, advanced to their their first Premier Division Championship game since they won it all in 2014, to face four time champs Cavaliers. The winner collects the A. O. Shirley Shield, in the clash that begins at 2:30 p.m.
Man of the Match Ian Irvin who bagged 4 for 44, led the Royal Knights’ bowling attach that began striking early, taking 2 for 23, with Anthony Slowly removing powerful Austin McDowall for a paltry 2. McDowall had punished them for 119 during regular season play. Road Town Wholesale followed on by losing 5 wickets for 31 runs that saw them reeling at 94 for 7, before Delano Johnny and Orlando France put on a 47 run eight wicket stand, helping them to reach 160. Johnny had a high score of 46, before he was caught by Ryan Mangal as Slowley’s second wicket on the day. Ivan trapped Curtis Jack lbw for 33, then took his next three wickets for an economical 11 runs. Royal Knights used two half century partnerships between opener Mangal and Jomel LaFleur for 54 and Mangal and Slowley for 51, as their platform to reach 163 for 4. LaFleur was caught at second slip by Joel Williams for 47 and Slowley by Wicket Keeper Jimmy Peters for 35. RTW’s Roy Caine and Johnny, snatched two wickets each. After whipping Royal Knights by eight wickets in their last matchup, Joel Williams said RTW had a different mindset for the match. Royal Knights and Cavaliers to whom they lost by five wickets, will face off in the final at 2:30 p.m. on Sunday. Fredericks said they know Cavaliers is a disciplined team who have won the title multiple times. Led by Man of the Match Rudolph Davis who bagged 4 for 26, Under The Tree advanced to their first Division I championships game after beating the Virgin Gorda Spartans by four wickets, despite a brilliant 72 from Stanley Joseph, who was stumped by Wicket Keeper Sessie Ells. Virgin Gorda were bowled out for 151. Shem Ellis finished with 4 for 36. In reply, Under The Tree used three partnerships of 37, 35 and 31, en route posting 152 for 6. Captain Emrol Prince led the way with skillful 45. Under The Tree and the Vikings will face off at 11 a.m.